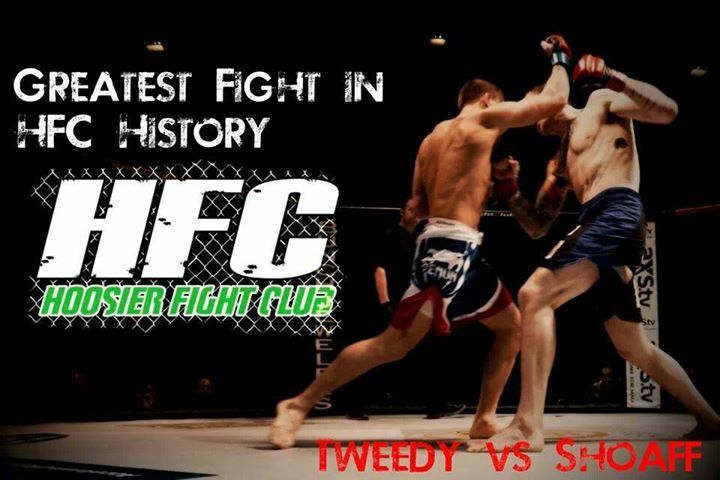 Tweedy was aggressive early and got a takedown, but Shoaff weathered the early storm and picked apart Tweedy with a series of kicks and devastating shots, knocking Tweedy against the cage. Tweedy appeared hurt by Shoaff’s explosive punches, but was able to survive the round. The second round was a huge back and forth battle both standing and on the ground, a round that two judges gave to Tweedy and one gave to Shoaff. Shoaff went off in the final round, displaying a relentless attack of speed and power. He started by cutting Tweedy’s nose open with devastating knees and continued to punish him throughout the round. Tweedy showed a huge amount of heart, but Shoaff dominated. The final horn sounded with Tweedy appearing to have a broken nose and the cage canvas splattered with blood. Shoaff won via unanimous decision, 30-27, 29-28 and 29-28. After the fight ended, Paul Vale made an announcement proclaiming it the best fight in the history of Hoosier Fight Club. “It was an honor fighting Austin and receiving greatest fight in HFC history. I’ll remember last night for the rest of my life. I wouldn’t change a thing. We put on a beautiful show and I was able to walk away, barely, victorious,” Shoaff told Chicago’s MMA. The card at the Porter County Expo Center featured a total of eight professional fights and five amateur bouts, including the first-ever women’s atomweight title fight. Lightweights kicked off the professional portion of the card with James Mogollon facing John Dutton. Mogollon landed a flush right kick that floored Dutton in the first round, and he would make quick work after the knockdown getting submission by guillotine choke at 1:02 of the first round. Gilbert Grappling fighter Justin Hughes made his pro debut against Michael Jordan in a bantamweight battle. Hughes managed to floor Jordan early with a strong overhand right. As Hughes went in for a finish, Jordan recovered and seemed to be active on the top position. Hughes looked to escape and got a reverse. Hughes tried to get busy on top but was caught in triangle choke by Jordan, forced to tap at the 4:08 mark of the opening round. Dustin Pape scored a unanimous decision victory over Yousef Al-Ghoul. Booby Moffat survived an early slam from Terry House to win by D’Arce choke in round one. Gilbert Grappling’s Rob Caulfield won via unanimous decision over Erick Lozano. Veterans Kevin Nowaczyk and Shamar Bailey fought to the final horn, with Nowaczyk’s wrestling and cage control the difference in a unanimous decision win.